Nigel Kane remains upbeat about Hastings United’s survival chances despite the increasingly concerning position the football club finds itself in. The U’s have picked up just three points from their last nine games and only goal difference is keeping them above the Ryman Football League Division One South relegation zone. There are three relegation places and fifth-from-bottom United are just one point above second-from-bottom Redhill. United manager Kane said: “I still believe we’ve got quality players; we just haven’t been clicking. If we can get our strongest 11 on the pitch then we will be alright. That’s what gives me the belief that we will be alright. The U’s lost 2-0 at home to rock-bottom Horsham last weekend and have won just twice since Christmas. “The last two reverses have been very disappointing, but everybody within the squad has got to remain upbeat and positive,” Kane continued. 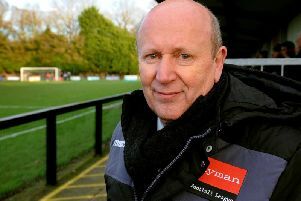 With Sam Adams due to return to the squad, the United boss is determined to end a run of five successive away defeats against 11th-placed Tooting & Mitcham United this afternoon (Saturday). Ryman League, Division 1 South: Tooting & Mitcham Utd v Hastings Utd. Macron Store Sussex County League, Division 2: Oakwood v Bexhill Utd; Westfield v Mile Oak. Reserve Section Challenge Cup quarter-final: Little Common v Pagham. Macron East Sussex League, Premier Division: Battle Baptists v Ninfield Utd 1.30; Hollington Utd v Robertsbridge Utd; Iden v Peche Hill Select. Division 1: Mountfield Utd v Wadhurst Utd; Ticehurst v Icklesham Casuals 1.30. Division 2: Catsfield v Old Hastonians; Crowhurst v Wittersham; Pebsham Sibex v Herstmonceux; JC Tackleway v Eastbourne Rangers 1.30. Division 3: Herstmonceux II v Peche Hill Select II; Ninfield Utd II v Eastbourne Athletic; Sovereign Saints v AFC Hastings. Division 4: St Leonards Social II v Peasmarsh Utd. Division 5: Battle Baptists II v Parkfield 3.30; Grasshoppers Old Boys v Sedlescombe Rangers II; Hailsham Athletico v Magham Down; JC Tackleway II v Mayfield 3.30; Ticehurst II v AFC St Leonards 3.30; Wittersham II v Victoria Baptists. Division 6: Battle Baptists III v Sedlescombe Rangers III; FC Westridge v Punnetts Town II; Hawkhurst Utd II v Sandhurst II; Icklesham Casuals II v Hampden Park Utd; Robertsbridge Utd II v Orington. Hastings & District FA Intermediate Cup semi-final (2.30): Bexhill Utd II v Ore Athletic. Hastings & District FA Lower Divisions Cup semi-final (2.30): Burwash v Little Common III. Robertsbridge Charity Intermediate Cup quarter-final (2.30): Westfield II v Sandhurst (at Sandhurst).